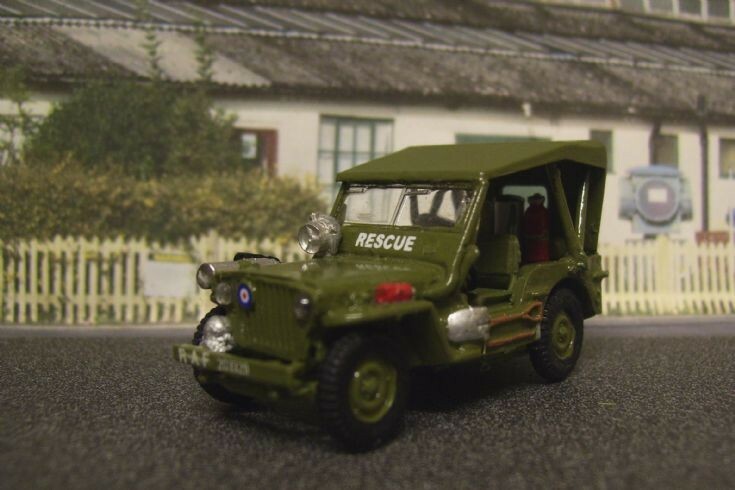 Transport Models - Willys Jeep R.A.F. Rescue. This is a total conversion of the Airfix 1/76 scale USA Army Willy's Jeep to an R.A.F. Aircraft Crash Rescue Unit introduced from around 1944 to the RAF and that was used widely during the Second World War.Its actually one of a range of R.A.F.emergency vehicles I'm working on at this time for a WW11 diorama. Pete, not a criticism, but the board below the windscreen should be red for a 1944 Jeep, white script is correct but it was usually AIRCRAFT CRASH RESCUE.i don't know where you will find transfers for that though. The equipment carried seems to have varied from Jeep to Jeep. Can't wait to see your other models. Added by Bristol Bob on 13 October 2013. Hi Bob, from official papers/photographs (MARKED RESTRICTED) from the period its difficult because the pictures are of course only black and white. I will repaint that part in red and re-apply the decal. I don't know of anyone who would supply me with a decal with Aircraft/Crash/Rescue and MABEX decals would need to be very small and really most difficult to apply being so tiny. I do try as near as possible to get things right, but especially with military vehicles I need some help because I know very little, but I felt that a model depicting this period in the RAF's history should of course be attempted. Added by Pete Matten on 14 October 2013. Pete I would not worry too much about this. It is quite clear is that whatever the regulations said there were lots of local interpretations and variations. The jeep would have been issued in olive drab (because that was what the USA churned out)and red paint would not doubt have been added to some extent. Added by George Illingworth on 15 October 2013. Thankyou George, its now already been done though and re-painted red. Added by Pete Matten on 15 October 2013. Try the following link for the decals you require. If you scroll to the bottom of the page there is a link to a full colour information sheet for the decals. Hope this helps. Added by Mick Shanks on 15 October 2013. Added by Ted Angus on 15 October 2013. Fyll ( see Mick's link) got the vast majority of his colour info from my records- but the sign was not normally applied below the windscreen until hostilities ended. All these types of signs are listed and authorised in Service publications - there is nothing for the sign we are talking about in the sept 19444 edition of RAF MT regulations. But its possible there may have been the odd one but t date I and fellow researchers haven't found any. The last sentence of my previous post should read -"post war until the time they were became red vehicles "
Added by Ted Angus on 16 October 2013. This model is now finally finished and although I changed the colour under the window to red?, I've now re-done it back to green.Although there is some doubt whether any wording actually appeared under the window for the period, I've still applied the tranfer(AIRCRAFT CRASH RESCUE)and the model looks alright. Added by Pete Matten on 18 October 2013. Pete if you are happy then that is it ! I am currently revamping the Oxford (British rail ) L4P to represent one they had at Farnborough- I know it wont be an exact replica but I am already happy with it and its still far from finished ! Added by Ted Angus on 19 October 2013. Ted, can you tell me when the Landrover MK1 was first introduced into the RAF Fire Service?.I want to later build a post-war fire station with appliances.I was thinking of around 1949/50.Pete. Added by Pete Matten on 19 October 2013. Pete, 49/50 it would still be the jeep but now into red. Without digging out my notes and sticking my neck out I would say 1953 for the first Landies. re 1949 that was not just the formal introduction of signal red but also the year the Services went to the new system of reg numbers ie from RAF 123456 to 00AA22 . I will dig the notes out re the first Landies but certainlt for 49/50 still the Jeep. Added by Ted Angus on 20 October 2013.